Chimney Cleaning Service | Chimney Sweep | Chimney | Kent Chimney Inc.
Our company owner does all of our sweeps! Call to schedule quick service any time of year. Fireplace performance goes up and the risk of chimney fire goes down significantly when you invest in annual chimney cleaning services. If you don’t already have a chimney cap, we are more than happy to install one for you. Chimney caps (also called critter caps) prevent animals like raccoons and squirrels from making your chimney their home. Chimney caps also prevent birds from getting trapped in the chimney flue. During a chimney cleaning, we will also check the chimney damper to make sure it opens and closes properly. We work hard to make sure your chimney is in working order before cold weather sets in. While on the roof, we will check the chimney flashing to make sure it isn’t loose or missing. Chimney flashing is responsible for directing water away from your chimney to prevent leaks. Chimney waterproofing will save you money in repairs later. 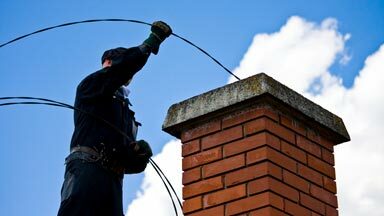 We make sure every chimney we service is in proper working order. If you are interested in our chimney maintenance services, give us a call at (616) 949-7722.